Fed-up with stodgy shop-bought mince pies? Then book Al Fresco Feasts to serve your Christmas party, whether for work or at home, and taste our delicious Ultimate Mince Pies: perfect for serving with mulled wine. Although we can’t pretend it’s easy to turn out perfect mince pies every time, we love sharing good food, so we’re happy to give you our special recipe for the ultimate mince pie! Being event caterers committed to only using the finest flavours in our food, we always make our own mincemeat. If you want the very best too, use our mincemeat recipe at the bottom. One jar – or better still, use our delicious mincemeat recipe at the bottom! Put icing sugar, flour, orange zest and butter into food processor and mix until as fine as bread crumbs. Continue mixing whilst slowly adding orange juice until it becomes a moist ball of dough that’s not too sticky. Wrap in cling film and leave to rest in the fridge for at least 20 mins. Take the chilled pastry from fridge, divide into two and roll half out onto a floured surface until about 3 mm thick. 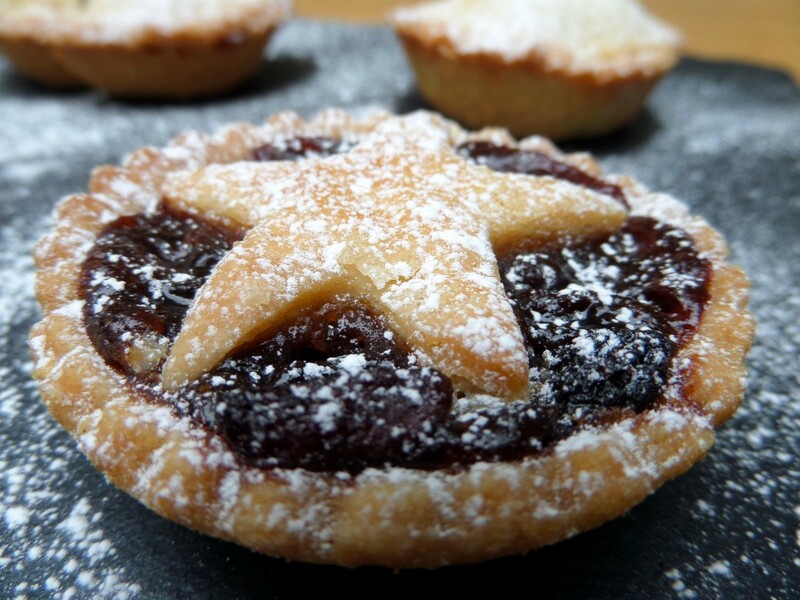 Using a 7.5cm pastry cutter, cut out circles and put them in your mince pie tins. Gather up pastry scraps and roll again. Cut out 6cm circles (or if you’re feeling more decorative cut out stars instead) and put to one side. Fill the lined tins with mincemeat level with the top of the pastry. Moisten the edge of the pastry with a little milk or water and place the smaller circles on top, pressing lightly to seal. If you’re using stars, just place them on top. Brush your mince pies with milk and make a couple of small nicks in the top with a sharp knife. Cook in preheated oven (180ºC) for about 25 mins, until brown on the top. Leave in tins to cool for 15 mins, then remove them and place on a wire rack to cool. When ready to serve dust with icing sugar and enjoy! Can be made in advance and kept airtight in a cool place for a week. They also freeze well. Mix all ingredients except brandy together in large bowl. Heat oven to 120ºC. Cover the bowl in foil, and cook for 3hrs. Remove from oven and stir. Leave to cool to room temperature, then add the brandy and put into sterilised jars.